We developed this website as a means to introduce our company, showcase some of our work, and hopefully provide you with some information and inspiration for your next home improvement project. We have continuously provided our finish carpentry and home improvement services to homeowners and builders throughout the last 29 years. In perspective, that translates into literally thousands of rooms of crown mouldings and miles and miles of chair rails and baseboards. 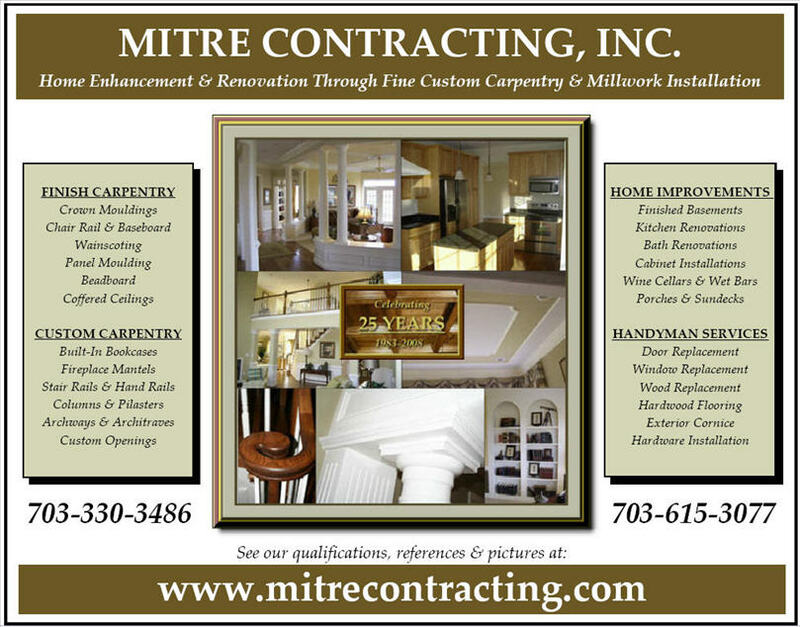 I have personally constructed over two thousand stair railings, and have installed over 75,000 interior doors. I wouldn't even attempt to guess how many kitchen and bath cabinets we have installed in the thousands of kitchens we have put in through the years. Our longevity and project history speak volumes about our commitment to upholding our reputation through a solid work ethic that values quality, dependability and integrity. Mitre's image and reputation are far more valuable to me than any monetary gain that could be achieved through cutting corners or defrauding customers. A company's fancy marketing sales pitches about quality and workmanship start to ring kind of hollow when a "carpenter" shows up at your home with only a few years of experience. All the gimmicks they promote, and uniforms they wear, can never replace over 30 years of carpentry and home improvement experience. If you're so inclined you can check out our "Company Information" links to the left for more information, then look through the Blogs at some articles on different subjects pertaining to our work and see photos of our past projects. Take a few minutes to browse through our Before & After pages and our "Photo Albums" to see some of our work. I have posted over 400 or so pictures for your perusal, with more being added on a regular basis. Whatever home improvement project you can come up with, I'd like to think we have it covered and have performed it many times over. Our goal is to ensure our continued success through providing complete customer satisfaction in every project we undertake. Satisfaction in the presentation, the product, the process, and the workmanship, All the way through to the clean-up, I will personally do my best to see that goal achieved.